Raghuram Rajan is preparing to deal with concerns that may arise when a new government takes charge. Politics plays an important role in economic matters, and even a celebrated economist like Raghuram Rajan cannot ignore the political changes that are likely in coming months. The Reserve Bank of India (RBI) governor is staring at two big challenges that could arise from the outcome of the Lok Sabha polls that end in May. First, financial markets have been displaying what some may call irrational exuberance on expectations the Bharatiya Janata Party (BJP) will form a stable government after the elections. The second fear is whether the RBI and the new government will have any major difference of opinion, especially with regard to fiscal consolidation. The short-term challenge for Rajan will be to deal with the movement of financial markets if the outcome of the general election springs a surprise. Investment banks and brokerages such as Goldman Sachs, CLSA and Nomura have come out with reports predicting that the BJP and its allies will come to power. This expectation has driven the Bombay Stock Exchange's benchmark Sensex six per cent higher in the past three months, as foreign institutional investors pumped in close to $4 billion. The surge is a cause for worry. "Clearly, markets are anticipating a stable government and rapid policy action. To the extent markets are disappointed, it will reflect on stocks, perhaps on bond markets and exchange markets," Rajan said after keeping interest rates unchanged on April 1. "We have to be prepared for some turmoil." Market observers also say the stock market could drop sharply and foreign investments may pull out their money if there is a fractured verdict in the polls. In such a case the rupee would be vulnerable. A depreciating rupee would mean higher imports, which would push inflation higher. So, Rajan is talking about readying to meet any eventuality. He has done it in the past. In September last year, when the US was planning to curtail quantitative easing steps, Rajan managed to attract over $30 billion by opening a swap window for banks to raise deposits from non-resident Indians. That helped the rupee gain from almost 69 versus the dollar in August to about 60 currently. Rajan has introduced more measures to protect the rupee. In order to curb hot dollar inflows, he barred foreign portfolio investors from buying treasury bills with maturity of less than one year. At the same time, he is encouraging these investors to put money in longer-term government securities. He has allowed foreign investors to hedge foreign currency risks by using exchange-traded currency futures on domestic bourses. This will also help the rupee, which saw a lot of speculative activity in the offshore market last year that hurt its value in India. Besides, the RBI is buying dollars to build a strong foreign exchange kitty, which is now close to $300 billion. The RBI governor is also worried about the fiscal consolidation road map that the government must follow in order to create room for him to soften interest rates, a key factor in driving growth higher. The full-year Union budget for 2014/15, likely to be presented by July, will provide a peek into the mind of the new government. Rajan is hoping for a budget that will take the fiscal consolidation process forward. Other key issues in understanding the government's agenda include setting minimum support prices for food grains, and fuel and fertiliser subsidies. A point of dispute between the RBI and the new government could be inflation targeting and its role in determining interest rates. 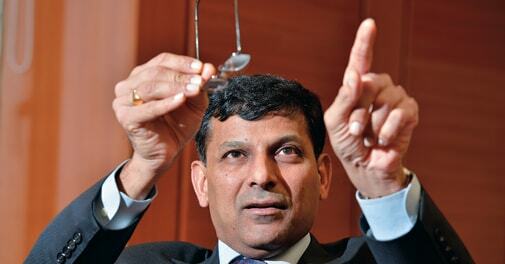 Rajan remains hawkish on inflation and has raised interest rates thrice since September. In the monetary policy review on April 1, he stood pat on interest rates despite calls for a reduction to boost economic growth. Also, the central bank has now made inflation based on the consumer price index as a guidepost to consider any cut in interest rates. It aims to bring down consumer price inflation below eight per cent by January 2015 and to six per cent by January 2016. Analysts say it would be difficult for Rajan to cut rates if inflation accelerates and the fiscal situation worsens due to any populist government policies. The stiff inflation targets suggest there is unlikely to be a rate cut in the near future. "In such a situation, growth and investments could be casualties in an already fragile environment," says Yogesh Agarwal, Managing Director and CEO of paper maker Ballarpur Industries. Analysts say monetary policy alone can't tame inflation because of constraints in food supplies. "There are administrative fixes and fiscal measures that need to be adopted. This is all the more important because the inflation problem that confronts us is largely the result of supply-side factors," says Sidharth Birla, President of lobby group Federation of Indian Chambers of Commerce and Industry. Rajan, who was handpicked by Finance Minister P. Chidambaram, has been quite independent in handling the RBI's affairs so far. Some analysts fear the relationship between the RBI and the new government could deteriorate if a non-Congress alliance comes to power. While those fears may be unfounded, Rajan will still have to tread cautiously in the coming months to control any excessive market volatility and deal with a new government.